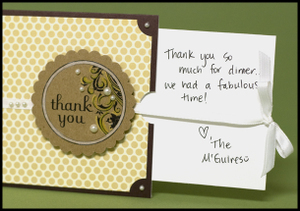 Slider cards have been around in the stamping world for some time, yet I still find people love them in classes. I promised some students that I would share the steps for making one, so I thought this was the best place to post them! If you haven't seen a slider card, here is an example. You just pull the bow on the side and the inside slides out. Cut notecard (or two pieces of cardstock) to 4 ¼" x 5 ¼". (This step isn't necessary - just if you want to decorate it like I did.) Cut a piece of 4" x 5" patterned paper to cover the card. I used ½” circle punch to cut little notches in the corners. Adhere to front of card. Use a ½" or ¾" circle punch to cut a half circle in the center of the notecard's right edge. Punch a small hole about ½" to the left of the half circle. Place THIN lines of adhesive around the other three edges of the card to seal it. (I prefer to use a sewing machine to instead stitch these edges - it works really well. However, I wanted to show how to do this with adhesive instead.) Also put a bit of adhesive about 1 ½” from the left edge of the card. Seal the card closed. Cut a piece of cardstock piece to 3 ½” x 3 ½”. Drape a long piece of white ribbon through the hole, holding it as shown. Gently push the square cardstock piece into the opening of the card, pulling the ribbon in with it and stopping when square is just slightly showing. Tie a bow and trim. (I find this card works best with narrow satin ribbon - it just slides like butter! Now, just decorate the card however you want! I like to cover the small hole that the ribbon goes through. I do this by putting something over it with pop dots - being careful not to place the adhesive onto the hole or ribbon itself. On this card, the scallop circle hides the hole. That's it! It really is simple. By the way... that cute tag is from The Living Room Floor. I bought some tags from this gal and she turned out to be the sweetest thing. Be sure to check out Stephanie's stuff! I am going to love love love checking your blog out! Getting my Jennifer goodies fix! Congrats on your new blog! Love you lots. Can't believe I have never tried one of these. Your directions are really clear...I'll have to try one. Fabulous start(s) to the blog, girl! Love it! The name is fantastic! (Way to go, Ken!) Congrats on incorporation, and the new blog. :D You are the master of cards! Oooh! I've never seen these before...excited to try one! Absolutely fabulous!!!! Terrific Project. Wonderful, wonderful work! I love this card! I plan to make some of these for my friends! I can't wait to try this! What a fun idea! 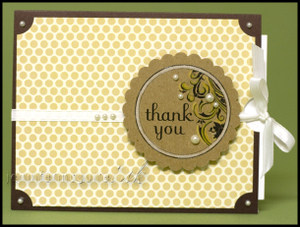 I made a thank you card using your design. Wow is it simple! Thank you for the technique. I like it and will probably do it often. I can't wait to try this. It is so cool! Awesome and fun cards!! I can't wait to make some for some friends having b-days soon!